Here are your most common questions answered. Feel free to submit more and we’ll add them to the list! Can’t I just get a ball-park price online? Is my roof suited for solar? If I have solar panels installed how will this affect my roof? Do I need to have the roof renewed before the solar panels go on? How will solar affect the aesthetics of my roof? Isn’t solar expensive? How much do solar panels cost? What about my home value? Will solar have a negative or positive effect? Is a solar lease a good idea? What financing options are available (lease, loan)? Should I lease (or use a PPA) or buy my solar system? How do I know if I qualify for a lease program? Can you confirm that I would not need to put any money down to go solar? What should my monthly Solar Lease or PPA payment be? Will I be ‘off the grid’? Do I need batteries for storage? Will my solar work if the power goes out? Do I need batteries for my solar array? Why would I want a phone call from a solar installer? This is the question, but it’s the same as asking “how much do cars cost”? What kind do you want? How much do you want to save? There are numerous factors that go into the cost of a solar array for your home, including the state you live in, the size of your electricity bill, the direction your roof faces (South vs. North), and so on. But this is the primary reason why solar calculators have limited value: every additional factor that gets added in the calculator can dramatically change its accuracy. In many cases it’s going to be far more effective to get a qualified solar installer to review your details to come up with a hard cost estimate. See our post: How long do solar panels last? Many customers wonder about ‘new solar technology’, but actually the technology was developed in the 1950’s, and has been consistently improved upon. Initially solar panels were mainly used by NASA, so the fundamentals are strong enough to support satellites and astronauts. Solar panels like the ones that will go on your roof are designed, tested in labs and real life to withstand rain, snow, hail, wind and of course the sun. The predecessors of modern solar panels made in the 1970’s are still producing power. Today’s panels also benefit from 60+ years of development and improvement! Bottom line: All panels are guaranteed to be producing power in 25-years, and most installers will offer a 10-25 warranty on workmanship and a power production guarantee. There are indeed some ways that a ‘ball-park’ price can be given through an online tool, however these are often not accurate because no two homes are the same. If you answer 5-10 questions, and you’re guessing at some or all of them, then the answer you get back is going to be very wrong. Reputable solar companies use sophisticated software, years of experience and take into account the complicated utility bill structures, finance options, etc. to give you a customized proposal that is specifically tailored to your home. Given the complexity, wouldn’t you rather have an expert’s opinion? We recommend speaking with a couple of installers to make sure that you understand your options. All good solar companies will happily take the time to answer your questions. Start now by entering your zip code below to be matched with installers in your area. You may be surprised to learn that some states – not especially known for the amount of sun they get – have the best payback rates for solar panels due to the presence of local incentives. Solar panels don’t necessarily work better in sunnier areas (hotter panels can be less efficient). The largest factors in determining the payback of a solar array is the cost of electricity in your area and the presence of incentives, tax credits, or other programs designed to make solar more affordable. About 60% of roofs are suitable for solar. 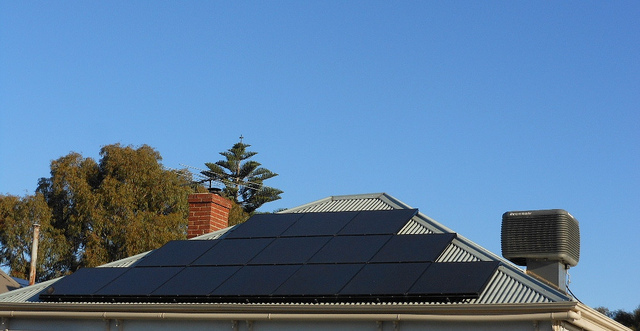 If your roof is not suitable, you might be able to place the solar installation elsewhere on your property. There are many variables in determining if a roof is suitable for a solar system, but the three main ones are: orientation, shading and roof condition. Orientation: your roof should be facing South, West or East. Shading: solar panels need direct sunlight for best performance, but some shade during parts of the day is OK. Roof structure and condition can be hard to assess, but generally speaking if your roof is in good condition and your home is less that 25 years old you should be fine. On average, you’ll need at least 300-500 square feet of roof space that is facing the correct direction, gets good sunlight and is in good condition.Complex roofs may require a more custom design, however current micro-inverter technology should allow for a successful design and installation. A qualified installer will be able to help you with the specifics of this. Check out our post on the topic: how does roof position affect solar panels? When you install a solar array it does add quite a bit of equipment on top of the roof: the entire scaffolding for the panels, wiring, etc. This means that any roofing projects should be taken care of before the panels go up, if possible. Having solar panels installed raises the value of your home, saves you money, and gives a modern look to your house. The effect of the installation to the roof is minimal and when installed, panels don’t create noise, not even in windy conditions. Besides the traditional blue color, there is a possibility to choose black panels for those who desire an appealing technological look while maximizing efficiency. In a word: no. Solar is quickly becoming mainstream technology and over the last 7-years or so, the price of solar panels has fallen by 80%! The biggest benefit of solar is that you can lock in years of predictable and affordable power (the sun’s energy is free after all), and the biggest hurdle has been costly equipment. With the dropping prices, more efficient permitting and installation processes plus innovations in financing – solar is more affordable than ever. While it is likely that prices will continue to decline slowly, a much bigger impact on the final price you pay are the incentives. The biggest and most effective incentive is currently available only until the end of 2019. Thought you’d never ask! The main savings from installing solar is replacing your expensive and volatile electricity bill with a new source of more stable and cheaper power. Your power bill is rising each year (and sometimes by large amounts! ), and most estimates calculate that your bill will be 2-3x more expensive in 20-years. So when you install solar you are signing up for cheaper power for a 20-year period. You are eligible to receive incentives to help reduce the initial cost (see below) and then solar power off-sets the bulk of your utility bill. This off-set is known as “Net-Metering.” You receive a credit for power produced from solar, typically during the day when prices are high. Then at night, when we are using most of the electricity you are charged normal retail rates. During the course of the year you will average out that your credit offsets the most expensive parts of your bill – saving you money! – Firstly you’ll want to make sure that you go solar with an experienced and reputable company that will properly install the solar panels on your roof. “An ounce of prevention is worth a pound of cure.” Solar installations do not cause any long-term damage to your roof when properly installed. – Secondly, now that we know the solar will be properly installed, there have been many studies, by the National Appraisal Institute, Wells Fargo and Lawrence Berkeley National Labs that suggest solar adds significant value to a home – often the added value in equity is more than the cost of installing solar in the first place! So in simple terms, solar increases the value of your home and can help reduce the time to sell your home. When does the Federal Tax Credit for solar panels expire? The 30% solar ITC (Federal or Investment Tax Credit) has been extended till the end of 2019! The ITC will now continue at 30% until the end of 2019 for both homeowners and businesses, and then step down to 26% in 2020, then 22% in 2021, then finally phasing out completely in January 2022. The ITC is essentially a 30% discount on the cost of going solar. See our full article on the extension of the solar Investment Tax Credit. Like everything else in solar, it depends on you circumstances – credit score, available cash, size of solar array, and the specific financing options available to you. It also depends on whether you want to save more money now or over the lifetime of the system. Buying outright can earn you a lot more if you’re willing to wait for it, but both options will save you money. – State incentives vary from up front rebates to additional tax incentives. Currently many states offers both up front incentives and additional tax incentives. – Some Utilities, Counties or Cities offer rebates as well. This will vary greatly from region to region, so it’s best to ask your local installer, although there is some information here. Ah, to lease or buy a solar system – this is a great debate. Ultimately both have their pros and cons, and here we try to break this down for you. If you choose to own a system, it will likely require $20,000 – $50,000 up front (you’ll get 30% back as a tax credit on the current tax year) and you may have more long-term financial benefits, but the risk and cost are yours to manage. With leasing a system you will have more immediate benefits, including immediate savings and no maintenance worries, but you will forgo some of the long-term financial benefits of ownership. OWN/SOLAR LOAN: If you can afford to a own a system (either cash or loan) and your simple-payback is shorter than the period of workmanship warranty, and you don’t mind concerning yourself with maintenance issues, then ownership might be a good option. LEASE / SOLAR PPA: If you like the idea of 15-30% savings on your electricity costs for years to come without the risk or complications of ownership, or you don’t want to invest the money or don’t have the tax liability, then leasing might be a good option. BOTTOM LINE: Most reputable installers will be able to talk through a couple of solar financing options with you, so you can see in more specific details the cost-benefits of both models. – Typically you must have an average electricity bill of $100 or more. – You must own your home, and plan on living there for at least 2 more years. – You must have good to excellent credit. Most programs require a FICO score of at least 650. And of course you have to want to go solar! In many of the above states with Leasing or PPA programs, it is very likely that you will be able to go solar with $0 down. You will need to speak with a solar installer to confirm this. Roughly speaking, most people see about a 15-30% savings per month on average as compared with their electricity bill. This amounts to an average of roughly $40 in savings per month. – You can buy the system at ‘fair market price’, which would theoretically be pretty low at that point. – You can extend the term of the lease period. It’s always nice to think of a ‘silver bullet’ technology, or massive short-term improvement, but solar technology is actually pretty established (and boring), so massive changes in the short-term are unlikely. The cost and efficiency improvements are incremental, and mainly do to small efficiency gains and manufacturing improvements. After all, there are lots of PhD’s in Physics, Chemistry, Engineering and Industrial Design working on this all the time! Add to that – your technology has to stand the test of time, so any ‘revolutionary’ new technology will have to be proven before you want to take the chance on it. Solar panels do require sunlight to make energy, however with light or intermittent clouds, your system will continue to produce energy. If there are thick, dark clouds, your system might still produce energy, but it may also temporarily shut down and automatically turn on when their is adequate sunlight. Solar energy has been massively adopted in Germany (not your sunny vacation destination) and also US states like New York and Massachusetts (even more than Florida!). Solar energy works great when there are cold or crisp sunny days. Of course, there are fewer hours of sunlight in the winter, but winter can be just fine for producing solar energy. 1. Most installations are installed at an angle, so the snow will melt and slide off. 2. Because the solar panels are dark, and snow actually allows a lot of light to pass through it, the snow will melt quickly off your panels (think about how a sunny patch of your driveway or the road is quickly free of snow. All solar panels that will be offered to you work in essentially the same way: they all convert the sun’s rays directly into DC power. Solar panels consistently make small improvements in efficiency, but the biggest benefit of solar technology is that it’s time-tested and proven; that the technology lasts and continues to produce power for 25 years at least. 1. Mono-Crystalline: These are the most ‘efficient’ at turning sunlight into energy. These panels will require the least amount of roof area required to produce 1000 kWh. They are often a darker blue, and are also typically used to produce the effect of an ‘all black’ solar panel. They are also the most expensive. 2. Poly-Crystalline: These panels are very similar to Mono-Crystalline panels in their basic form, but are slightly less efficient. The cells are often a brighter blue, and may appear more ‘speckled’, although they are also often available with a black frame or black background (technical term ‘back-sheet’). These are the most widely used solar panels as they have a good blend of efficiency and affordability. They are less expensive than mono-crystalline panels. 3. Thin-film: These panels are often not made with silicon wafers, but made by applying a very, very thin layer of a special ‘paint’ of very fine particles of specific metals. This technology is the relative ‘new-comer’ on the block and has the benefit of a very even coloring. Often the cost of the panel is the lowest, but the most amount of roof space is required and sometimes installation labor can offset the savings. These panels have some additional benefits, but are least widely used in residential applications because they require more roof area. Check out our post on the most efficient solar panels. This is a great and relevant question and topic. Solar, like many of industries, has become a truly global industry, and like many other manufacturing industries, China has taken a general ‘lead’ in terms of volume of products manufactured. Take a look at your phone, your computer, your clothes, etc. So, while I support the growth of the American economy as much as anyone, it’s difficult to say that you should purchase American made solar panels. In terms of job creation, installing solar and helping your friends go solar will create far more jobs than simply purchasing American made solar panels – so that’s the good news! Then there is the complication of how solar panels are made and understanding global corporations. Some companies used to manufacture a small percentage of their product in the USA, but were Chinese corporations. There are “American” companies, with headquarters in the USA that manufacture in Asia. There are German companies that manufacture in the USA. Ultimately whether you decide to purchase American Made solar panels or solar panels manufactured elsewhere in Asia, you can rest assured that your decision to go solar has a positive impact on American job growth! Plus you’ll benefit financially, create a cleaner, safer and more robust energy system for the whole country, contribute to cleaner air for your children and community… the list goes on! Ah the image of the cabin in the woods with a solar panel! This is what most people think of when they think of going solar. You will most likely be installing what is called a “grid-connected” solar system, so no you will not be “off the grid.” This means that you will continue to draw power from the power lines at night, but during the day you will use your solar power, or “spin the meter backwards” and you will get a credit for what you produce that offsets the cost of buying electricity at night. This is called net-metering. No, you will not need batteries for storage. However, as the price of batteries comes down, and their benefits are better understood, batteries will likely become a more affordable and mainstream technology. So go solar now, and add batteries later! Caveat: if you live in an area with frequent blackouts, or having power is critical, you can speak with your local installer about battery back-up systems. Batteries do add a significant cost in materials, installation and ultimately maintenance, so you’ll want to be sure about your options. No, your solar system will shut off automatically if the power goes out to protect maintenance crews that might be working to fix the problem. If power goes out regularly in your area, you can discuss options with your solar installer, as there are ways to add batteries and specific products that can help you have at least some basic power during power outages. Do I need a battery backup system for my solar panels? Most solar arrays are grid-tied meaning they have no batteries and simply feed energy into and out of the grid. There are major cost and maintenance advantages to not having to deal with batteries. See our full article here: how does grid-tied solar work. What happens if it snows on my solar panels? Great question. Obviously any physical obstruction to light is going to keep solar panels from producing electricity, and one important thing to keep in mind is that if one panel in a solar array is significantly covered with snow or debris, then it compromises the output of the entire system (think Christmas lights). This can be circumvented with panels that carry their own microinverters, but that’s another topic. There’s only one way to know if solar will work for you: get an estimate from a professional. The reason is that each system is unique, and the costs of installation depend on your geographic location, incentives, roof shade, among other factors. We’re big fans of having options and our goal is to get you at least a few different solar quotes to evaluate. Once you have a few proposals you can decide which one is right for you. We feel that solar panels are the next refrigerator: at some point we’ll wonder how we lived without them. As solar becomes cheaper than traditional electricity in the US and other parts of the world, this trend will only become more obvious. We’d love to help! Click the button below and fill out the signup form and we’ll get you started. By filling out the signup form on the site we’ll help you get in touch with solar installers in your area who can answer questions and provide a specific estimate. Our goal is to get several estimates in your hand that you can use to compare options. With a little additional research you should be able to determine the best solution for your needs. Great question, as we know now that solar leases last around 20 years, and solar panels at least 25 years… and there is a good chance we’ll move in the next 20-years! – Your buyer will need to assume your lease, although if this is still a good option for them, as it likely will be, they will be interested in assuming the lease. – You can also buy-out your lease from the provider at that point, and this should increase the sale price of your home. – Solar installs increase the value of homes and reduce the time on market. So as long as your solar system is in good shape, this should make it easier and more profitable to sell your home. Of course you will hear horror stories of things gone wrong in selling a home with a solar lease or solar panels. However, if you have a marketable home and reasonable sales expectations and a good real estate broker, solar will be an asset, not a deterrent. This is the case in the vast majority of home sales. What is certain is that you will need to be aware of the solar, just as you would be prepared about questions regarding a pool or a recent remodel.